On March 1, 2018, a group of adventurers summited Mount Kilimanjaro on the first all-vegan expedition to Africa’s highest peak. The idea to climb Kilimanjaro started when San Diego native Mike Weinberg wanted to challenge himself in his 65th year. Being vegan for 21 of those years, he found discomfort in the thought of sharing his experience, particularly sharing meals, with non-vegan climbers. He decided to put together a 100% vegan team to exhibit the nutritional power and athletic performance capabilities of a whole food, plant-based diet. To recruit like-minded climbers, Weinberg created the Vegan Kilimanjaro Plant-Based Nutrition Challenge. With social media to spread the word, the team grew to include international participants from Canada, Norway, South Africa, France, and Switzerland. The group consisted of 17 climbers of varying experience ranging in age from 18 to 70. It was one climber’s very first trek with an overnight outing. Another had never scaled a mountain higher than 1,000 feet. But what they all had in common was a devotion to a vegan lifestyle. Ultimate Kilimanjaro provided a 100% vegan diet and mess tent with segregated utensils, cooking gear and food storage. The group chose to climb using the six day Machame route, a beautiful but challenging path. The largest and perhaps first all-vegan team performed remarkably, successfully climbing the tallest free-standing mountain in the world. 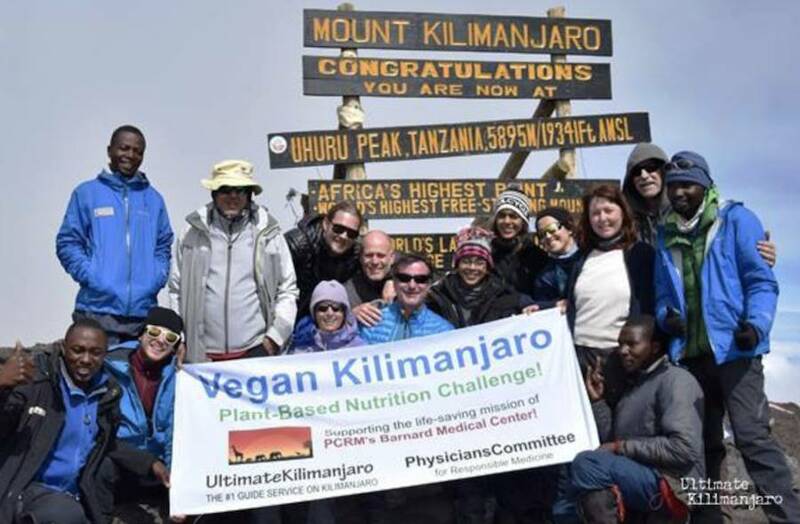 At the summit, the team unfurled the Vegan Kilimanjaro banner promoting PCRM’s Barnard Medical Center, the world's first plant-based medical facility. The center, located in Washington D.C., takes a new approach on medicine by emphasizing the role of diet and nutrition in the prevention and treatment of illness and chronic diseases. Besides fulfilling personal goals, the participants of Vegan Kilimanjaro demonstrated the heights of achievement possible on a healthy, life-enhancing, plant-based diet. Their adventure has been reported by media outlets such as American Vegan, Vegan Health and Fitness, VegWorld, Vegan Life, PETA, Vegan Food & Living, and Live Kindly. Weinberg discusses the Kilimanjaro climb in this interview conducted by Vegan Nation WCUW. Inspired to go on your own vegan Kilimanjaro climb? The second expedition, Vegan Kilimanjaro 2, is in the planning stages. For costs and logistics, visit www.maxlearning.net/VeganKili/VK2Details.pdf.